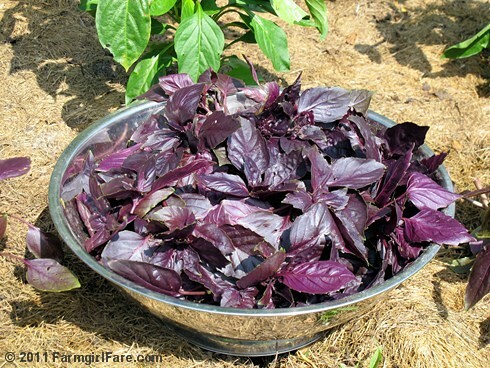 Farmgirl Fare: Recipe Ideas: Wondering What To Do with Purple Basil? Recipe Ideas: Wondering What To Do with Purple Basil? First harvest of the season on 6/28: a pound of Red Rubin basil from three plants. Four years ago I grew my first purple basil—and had no idea what to do with it. And then I turned it into pesto. Wow. Except for the fact that purple basil doesn't look as pretty as the green in many dishes, and makes a rather oddly colored pesto, I would probably quit growing the green stuff altogether. After a surprisingly rough start this spring (since basil is one of my few never-fail crops), I now have three Red Rubin purple basil plants flourishing in my kitchen garden (although they're not yet flourishing in that post). They've given me over 1½ pounds of beautiful bounty so far, and there's already more that needs to be picked. For my favorite pesto recipe, along with lots of other ways to use purple basil, check out this post: Growing Purple Basil and What To Do with It, Plus My Purple Basil Pesto Recipe & the Easiest White Bean Appetizer Dip/Spread Ever. I've added printer friendly versions of the recipes, and there are links to all my basil growing posts and favorite basil recipes included, too. Have you ever grown or purchased purple basil? What do you like to do with it? © FarmgirlFare.com, where we're deep in the heart of pesto season. I grew purple basil a couple years ago and I didn't really like it. The leaves seemed a lot tougher and less succulent than green basil. I never did use it to make pesto...I was curious what it would look like. I bought purple basil this year and am hoping it reseeds like the lady said it would! I like to make basil vinegar with it. I use white wine or rice vinegar, and it turns a beautiful ruby red color that doesn't fade. I prefer green basil for cooking with, but sometimes use both green and red basil together, such as scattering on top of fresh tomatoes. I never used purple basil for pesto, but will have to try it sometime. I saw someone beat me to it, but I would suggest basil vinegar also. I bet it would look very beautiful in a simple butter-basil pasta type dish! I like to put it in a tossed salad; it adds a lovely fragrance and taste. Or add to tomato salads. wonderful ideas: I will try the pesto and vinegar for sure. I use my purple basil with burrata and heirloom tomatoes, same way as with the green basil. Garnished with some blossoms,it looks really nice and tastes heavenly. I love the color but purple somehow strikes me as an odd 'color' in pesto. I'm going to take a look at your recipes and maybe next year grow some, too. I love, love, love pesto!! No, I haven't tried purple... but my green basil finally took off... we've had such a slow starting summer here in Seattle. We make a beautiful purple basil jelly. It is a glowing, jewel color, with a sweet, toast/friendly flavor. Well I did learn one thing when I grew purple basil a couple of years ago - don't use green and purple basil together in pesto. I should have remembered from kindergarten that mixing purple and green isn't a pretty color lol. I've never used it, but I imagine it would be a wonderful choice to use in a parmesan, basil and sour cream dip. I imagine all of the flecks and shreds of purple being so pretty. I think I would grow it just because it is so pretty!!!!! I just grew the purple stuff for the first time this year. Add some unsweetened yogurt to your favorite pesto recipe and cut the amount of olive oil and cheese you need. Not only is is yummy and creamy, but it also changes the color to a more pleasant one. I like to add yogurt anyway to keep even my green basil from being so oily. Sure I love olive oil... but sometimes enough is enough. You could make basil jelly with it. I steep basil in apple juice and follow any apple jelly recipe. You could make tomato basil jelly. You could make basil butter. Just mix softened butter, chopped basil, and a little salt and garlc. I imagine it would look stunning in a basil-garlic bread. used red rubin basil to finish off this recipe, in my cast iron dutch oven, outdoors: fingerling potatoes, onions, garlic and olive oil. basil can burn, so use it only at the end. I love purple basil in potatoe salad. Purple basil has a peppery zing to it that green basil does not in my opinion. I don't like yellow mustard so I use whole mustard with the purple basil and fresh dill. YUM! Purple basil is beautiful mixed in an arrangement of flowers, as a filler. I take a beef roast, rub sea salt on it the day before, then the day of cooking mince fresh garlic, fresh spicy oregano and the dark or purple basil, minced very tiny adding a bit of virgin oil to all the herbs, rubbing them to the roast. Best roast I have ever cooked!!! All from my herb garden..
We've been growing purple basil for years. When it goes to seed, you'll be surprised as to where it will come up next year. It's everywhere!